I never thought I’d be happy to see 99 degrees, but after yesterday’s 113, it feels pretty nice. We had a high pressure system yesterday that pushed air offshore, and brought the low desert air smack dab over Southern California, giving us the desert’s weather. Thus it was 113 in downtown Los Angeles by the coast, while the normally blistering low-desert cities of Needles, Thermal, and Palm Springs were only a chilly 106, frostbite weather for them. Even Costa Mesa was 96, with the only relief in the mountains at Big Bear at 80 degrees. The Fujis are starting to ripen early, so I picked one this morning for my lunch. They came through the heat without batting an eye, still crisp, juicy, and insanely sweet. This is no surprise to me, but reassuring none the less. I thought I had lost all the Gravenstein blossoms to the earwigs, but apparently they missed on on my tiny tree. 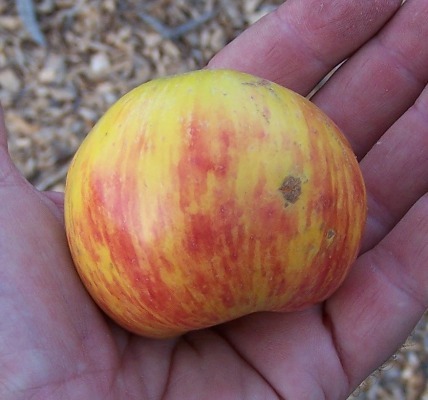 I was able to get this guy just in time before it started going mushy, and true to Gravenstein’s nature, it was crisp, juicy, very tart/sweet and full of apple aroma. I wish I had a whole tub of them to make pies, cider, caramel apples, and the like. This ripened a bit later than the ones in the mountains, a nice taste of early fall (even though it is suppoesed to hit 105 today here). By the way these are best picked a little green, and eat or process these fast- they don’t keep worth a darn. Terry Winter is starting to drop quite a bit earlier this year. Usually this Old Southern Keeper hangs on until December, but I’m picking up a half-dozen of them a day from under the tree, and they’re sweet and juicy with a bit of zippy tang, and very hard with a tough skin. They tend on the smaller side if you don’t thin them hard, and remind us all in taste and texture of mountain-grown Rome Beautys. It often baffles easterner’s minds to see a “high chill” apple variety bearing like this on our 200 hours of chill, and the excess of bare wood on the tree tells us it’s not exactly happy, but the apple crop is like this every year so I’m happy anyway. They keep really well and actually taste better after sitting on the ground under the tree in the hot sun for a week or so. I imagine they’d last half the winter in the crisper drawer, but none of ours ever make it that long uneaten. We’re trying these in the tropics next spring. 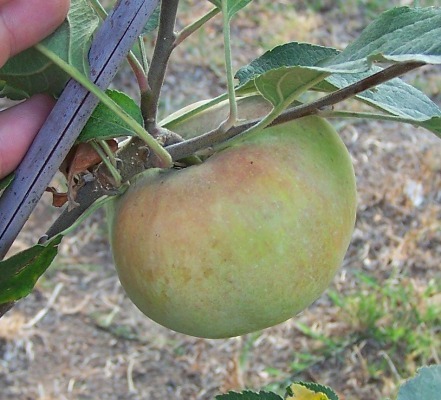 I disparaged it earlier in my apple descriptions on our website, but this apple is starting to grow on me. Bred by prolific apple breeder Garfield Shulz in Homedale, ID, Coconut crunch was supposed to have a dense, chewy texture and taste like a hunk of coconut. I can’t even taste a hint of that in ours (not unusual for our area), just a sweet-tart apple flavor that’s just a hint on the gritty side. 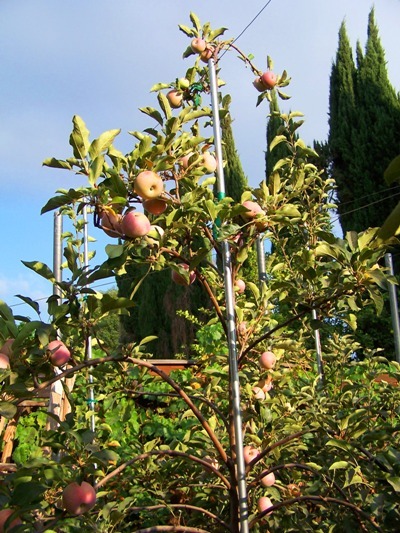 But the tiny little 2′ tall tree gave us 5 full-sized apples this year, with not a mark on them while everything else was riddled with codling moth. I don’t know if they just didn’t see it or don’t like it, but the healthy, productive tree and tolerable apples just might be a winning combination in the tropics. I bet it would make good pies.